The Shire of Warragul (1881-1990) was formed in 1881 when it was severed from the Shire of Buln Buln (1878). It covered an area of 136 sq km and centred on the town of Warragul, which is 102 km east of Melbourne. Most of the shire was prime farmland of undulating terrain, supporting dairy farming with some grazing and fruit growing. In 1906 part of Narracan shire was annexed and Warragul shire had an area of 352 sq km. The railway and highway into Gippsland pass through the former shire. The town of Warragul had extensive commercial, medical, educational and cultural facilities, serving a wide region beyond the shire boundaries. In 1990 Warragul was proclaimed a rural city and in 1994 was amalgamated with the Shire of Buln Buln and Narracan to form the Baw Baw Shire. The Gippsland railway (1878) passes through the former shire, and it was the railway that provoked the rapid growth of the Warragul township. Before then access to Gippsland was by the Old Sale Road through Brandy Creek, but this was replaced by a main Gippsland road through the townships. The new road was notoriously bad and it was the first project for the Country Roads Board (1913); appropriately, the first stage was in Warragul shire. In 1920 the improved road was named Princes Highway, coinciding with a visit by the Prince of Wales. The northern part of the shire had a railway from Warragul, ultimately extending to Nerrim South (1892) and Noojee (1919). In the south, the shire reached the Strzelecki Ranges. Most farmers found that it was best to move from mixed farming to dairy farming. In 1901 there were about 200 dairy farmers in the shire and by the 1920s their number had more than doubled. There were numerous creameries and dairy factories, such as Darnum and Bloomfield. Ultimately the factories at Drouin, Warragul and Korumburra prevailed, although much later Darnum saw all of them off. 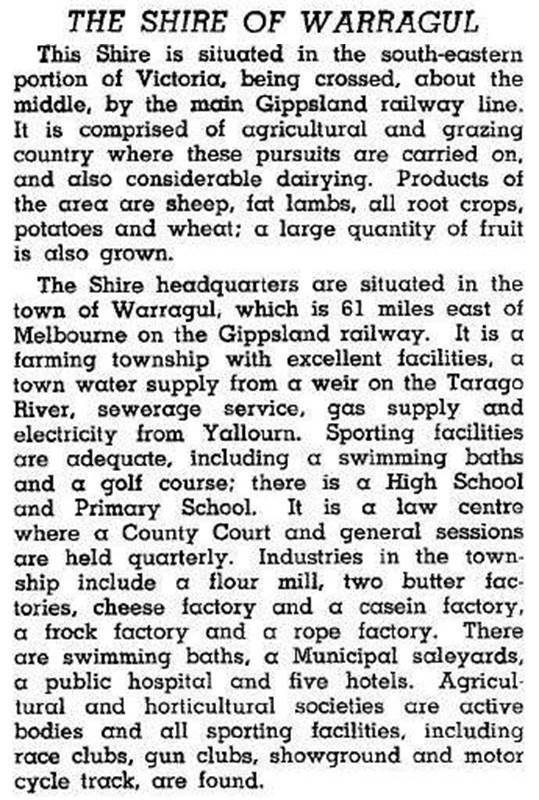 Dairy farming intensified and the shire’s population increased by about half between 1910 and 1940. The immediate postwar years witnessed a population increase of 30% between the 1947 and 1954 censuses. Most of the increase was in urban Warragul; from having 48% of the shire’s population in 1933, it had 62% in 1954. Decentralised manufacturing partly accounted for the town’s growth. Warragul also became a regional centre for West Gippsland. Warragul’s postwar urbanisation was acknowledged in 1990 when the shire was retitled Rural City of Warragul. The rural hinterland had 80% of the municipality under farming in 1994 with 16,080 meat cattle, 25,370 dairy cattle and 7000 sheep and lambs. In 1994 the Rural City was amalgamated with Buln Buln and Narracan shires to form Baw Baw Shire.